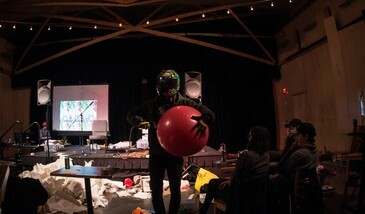 Sled Island is hosting a super fun, super weird talent show! If you have a bizarre or surprising talent, we want to see it at the Sled Island Gong Show on December 15, 2018 at the Palomino Smokehouse & Social Club. Bonus: it’s a Sled Island fundraiser! Participants will compete in front of our panel of completely unqualified judges for one of several great prizes, including Sled Island 2019 Discovery Plus Passes. Hosted by John Frosst (pictured). Anyone can enter! All you need to do is complete a short submission form to be considered. Successful submissions will be notified ahead of the event date.